Figure since nobody else has started April I will toss my projects out. I'm working on a family of common mergansers. Two drakes and a hen. They are a cary over from last month in various stages, ones primed up with eyes and ready for vermiculation in the wing pockets, the other is hollowed head attached waiting for a bottom board. The third had her head cut out Friday and will be my "red light" bird for the week. Then I decided it was time to dig a big hole and jump in with both feet. I got the bright idea to work on a goose. I guess because the full size cork geese I made last fall weren't heavy enough I figured I would try cedar ones. So I made a new pattern, ran my timber through the planer until it was square. Pinned the halves together with 5- 3/8" oak dowls and glued them up with tight bond III. I got it chopped out this far with the hatchet. Just trying to chase the line and get some weight off the block. I will try to finish the cut out with the band saw, but I've been having troubles with it lately. So if it doesn't go well I will be chopping it the rest of the way with the hatchet and draw knife. Hmmm... photobucket issues. I will look into it. Here are the three mergansers. Looks like I got the others to work too. Not sure what that was about??? Fall plumage Sanderling, balsa, rusty nail beak and oil paint. Fall plumage Golden Plover decoy, oil paint on wine case lid, not yet glazed. Been a while since I've had something on the bench to post so here it goes. I STRUGGLE with cans so I've decided to do several in a row and try to make some improvements. This is a tupalo canvasback that will be hollowed as soon as I cut in the sidepockets and decide what to do with the back. Once I finish sanding I'll crack it open and take out some wood. Ignore the head. Cut the crown way to narrow so the head will be put to side and I'll carve another for this decoy. Vince, I like the pose and the way the whole image came out. The sanderling has a curious look about him, wondering what that other bird is doing> Scott, perhaps if you lower the eyes a bit, the head will seem less of a problem. Other than that, seal, paint and prep for rig.! Thanks George. I finally have a knife that carvers balsa, so much less rasping & sanding. The painting was a result of a pattern I drew for decoys I have already cut out, one a flattie and the other hollow sugar pine. I'll start to carve them soon, after some trout fishing. Thanks George. Will most likely use it on another bird later. I just hate chasing a problem. I'm never happy in the end. sometimes, it gives one a really good feeling to solve the problem, even if the moment seems frustrating. That is why working on multiples, for me, anyway, seems to work. If I hit a wall with something, I can lay it aside for a while, until an aha moment occurs. On the other hand, I DO have a few milk boxes in the shop that contain heads just waiting for the proper moment for aha to happen. It was a lot easier when we had the wood stove!! Scott, that's a great looking Can. I love a good diver working decoy! I started picking away at painting a few more cork bluebills this weekend. Sadly, I didn't get too far since my little one wasn't feeling well and I was on solo daddy duty while mom was at work. Here's what I have done so far though. What do you guys think about the upper rump/primaries area? I don't want raised primaries since these are all going to be used and abused. Should I cut in any wing profile or leave it smooth-ish like they are on future birds? When it comes to birds, what I tell the kids that teach, it comes down to what makes you happy. If you are happy with the way those birds look and would be happy to hunt with them, then I say, hunt 'em. They look plenty good to me. Matt, are you sealing the cork before painting? I ask that because the material did not seem to have anything on it to act as a sealer. Unsealed cork, unless it is WILEY, will cause you some problems down the line. 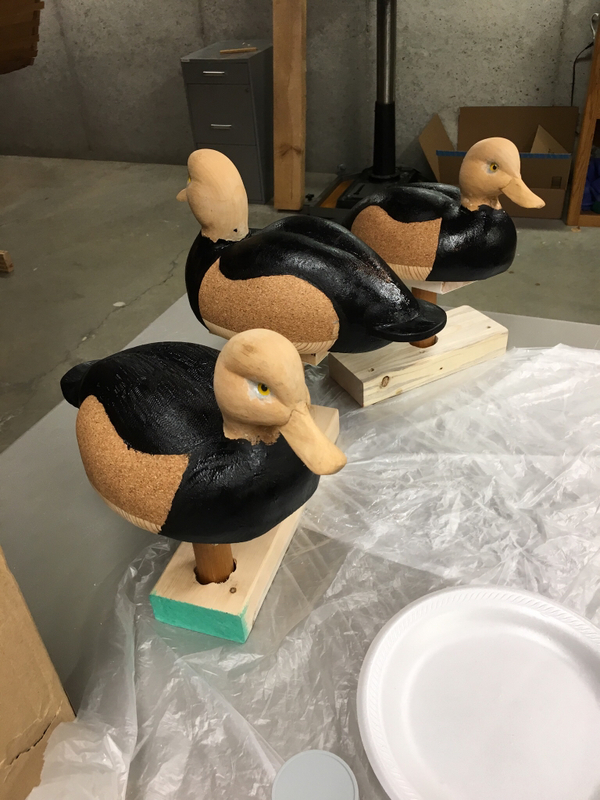 Hey George, I seal all the decoys before paint with 3 coats of an acrylic sealer that soaks in and doesn't leave a film. It looks unsealed when dry.